‘Karl Urban has landed the starring role in Amazon Studios’ straight-to-series drama The Boys by Garth Ennis. The Boys takes places in a world where superheroes embrace the darker side of their massive celebrity and fame and centers on a group of vigilantes known informally as “the boys” who set out to take down corrupt su perheroes with no more than blue-collar grit and a willingness to fight dirty. Urban will play Billy Butcher, who is described as mysterious and brutal with a personal but secret agenda. He approaches Hughie (Jack Quaid), claiming to be a shadowy government operative. Butcher capitalizes on Hughie’s rage over his girlfriend Robin’s (uncast) accidental death at the hands of Superhero A-Train (Jessie T. Usher) and enlists Hughie as part of his plan to bring down the superhero system. Karen Fukuhara, Erin Moriarty, Antony Starr, Dominique McElligott, Chace Crawford and Nathan Mitchell co-star. Supernatural creator Eric Kripke will serve as creator and showrunner on The Boys, which will be directed by Seth Rogen and his longtime producing partner Evan Goldberg. The trio will exec produce with Original Film’s Neal H. Moritz (Prison Break), Ori Marmur (Preacher), Pavun Shetty (New Girl) and James Weaver of Rogen and Goldberg’s Point Grey Pictures. 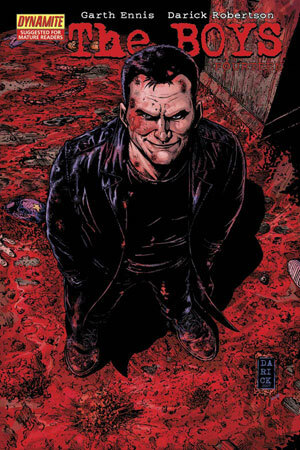 Comic author Garth Ennis and Darick Robertson are on board as co-executive producers. The Boys marks a reunion for the Preacher team of Rogen, Goldberg, Moritz and Ennis. Sony Pictures Television Studios, also home to Rogen’s AMC comic book adaptation Preacher and his Hulu comedy Future Man, will co-produce with Amazon. Urban is repped by UTA.